Between August 1 and August 12, 2016 six students from the American University of Central Asia (AUCA) and one student from the Institute of Mining and Mining Technologies named after the Academician Asanaliev volunteered to attend the Ecological Leadership Program in the beautiful Ala Archa National Park to improve their leadership skills and to learn more about Kyrgyzstan’s environment. AUCA president Andrew Wachtel visited the Ala-Archa Alpine Base on August 12 to congratulate and award the students with certificates for their successful participation in the ELP project. The director of ELP project and the students shared their experiences with the ELP project. The Ecological Leadership Program, or ELP, focused on three main subject areas: teaching ecology and water resources through outdoor immersion, increasing leadership skills through practical scenarios and mentorship, and teaching outdoor living skills to help students work independently outdoors. The program began August 1 on AUCA’s campus with orientation, gear packing, and preliminary classes on first aid, ecology, and Kyrgyz nature and culture. On the second day of the program, the students traveled up to Ala Archa National Park and began their ten days of training. As the students traveled farther up the Ala Archa and Ak-Sai River watersheds, they took classes on biodiversity and ecosystem services while living out of tents and trekking up to five kilometers each day. In addition to their classes, the students spent time rock climbing, glacier hiking, and had the amazing chance to climb to the top of the 4500 meter Peak Uchitel. 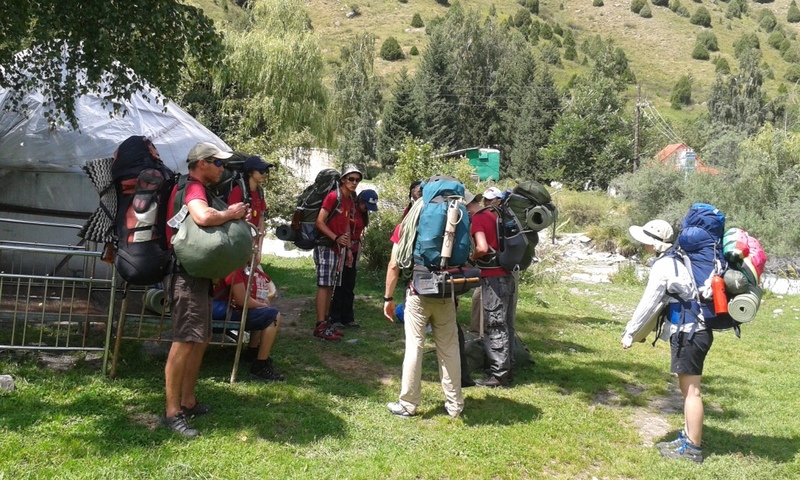 The course ended on 12 August with a graduation ceremony and dinner at the Ala Archa National Park Alplager. The instructors for the program were a diverse and professional group. American Nathan Fry served as the program director, AUCA Professor Zheenbek Kulenbekov worked as the faculty sponsor, and Australian Patrick Barrow and American Sonya Gluck were the program’s lead instructors. During the program, the instructors worked actively with the students to help improve the students’ leadership skills and teamwork through mentorship and challenging leadership scenarios. Designed to be a student-run program, the ELP included a rotating student “Leader of the Day” who planned the day’s events, ensuring that every student participant had a chance to lead the team. AUCA student participants included Altynai Abrakhmanova, Begimai Amantaeva, Begimai Ashyrlukova, Nurzhan Chunueva, German Don, and Nurali Orozbekov, along with State Polytechnic student Elpodin Kydyrmaev. The Ecological Leadership Program is the first outdoor education program of its kind in a Kyrgyz university and the student participants and instructor team hope that this program will inspire increased participation in outdoor education on the AUCA campus. Students who are interested in participating in an AUCA Outdoor Club or a future ELP program should contact one of the student participants or Professor Zheenbek Kulenbekov for additional information. I think this project was physical and spiritual challenge for every participant of the Eco-Leaders Program (ELP). Our way was long, our bags were heavy, we were out of our comfort zone, and sometimes pushed to our limits. Though our ELP instructors, we learned about the ecosystem of Ala-Archa, about the ecosystem services, how to navigate using just a map and a compass, how to stay alive in extreme situations, and (most importantly) that we can do more than we think we can. For me, as an EMSD student, ELP was a big experience, and I hope that in the future everything I learnt there will be helpful. Thanks to everyone, who participated in the creation of this project. As of the August 12 2016, I have completed the Ala Archa Eco Leader Program (ELP). I learned a lot of different skills and gained a lot of experience from this program. It was a great time, and I want to share my experience. First of all, ELP was a great opportunity to practice trekking, hiking, and campsite setup. We had interesting and challenging hiking in the lower reaches of Ala-Archa National Park as well as traversing the Aksay glacier and Uchitel peak. Almost every day we would develop our practical skills in these fields. Our entire student group loved the lessons in rock climbing. Through our instructors, those exercises were safe and mentally stimulating. Obviously, a critical part of the ELP was leadership development. Each day, each person on our team improved his or her individual leadership skills. We conducted different leadership exercises, in which students from different departments could share and reflect on their own ideas about ecological management and protection. For me, as a student of BA department, it was a very significant experience. In the future, I could connect business with something in ecological sustainability. It is imperative we conserve our natural resources and preserve a good ecological balance for the generations to come. Besides the practical part of ELP, we also had the different classes about ecology, such as ecosystem protection, water resources management, and cultural aspects of nomad history. In the Ala-Archa our group could conduct research on the present ecological situation in Kyrgyzstan, especially water and soil pollution. The main purpose of this program was to demonstrate that humanity could use natural resources without inflicting irreparable harm. I think that it was very informative, because we could see with our own eyes the main problems of Kyrgyzstan’s ecology. We had lessons where we would analyze how to improve the present ecological situation. It was a chance for us to apply our theoretical knowledge to a real-world problem in nature. I want to thank all the instructors and teachers, who taught new knowledge and experience. I hope this program continues next year. You are sweating. It is hard to breathe. You feel your pulse across your whole body. The sun is beating down on you, making the path difficult. In spite of all those natural barriers, you keep on going towards the destination. Thanks to the ELP project, I learned to not give up and to finish what I started. The program was packed with many physical and mental challenges. As a participant, I was able to be a part of a great team. Every member of the team was very helpful, so I felt the team spirit and support. I am thankful to have had this opportunity to participate in ELP 2016. On the trip, I got some food for thought, rethought my values, and, of course, developed my leadership skills. I hope this program may happen again next year. If it does, I am ready to help!